A slip, a trip or a fall happens in the blink of an eye and the results devastating. From broken bones to damaged ligaments, there are many injuries that can result. What can make the injury worse is that the accident was avoidable, which has resulted from negligence on the part of someone, including an employer, business, local council etc. This guide is everything you need to know, from slip, trip or falls compensation amounts to how to go about making a claim. We understand that making a claim is daunting but with our professional advice and support, you can claim the compensation you deserve. What is a slip, a trip or a fall injury? Who is Liable for Your Slip, Your Trip or Your Fall? How Much Compensation Can I Claim for Slip, Trip or Fall Injuries? Why Choose Us for Your Slip, Trip or Fall Claim? Being hurt in an accident is no fun and the same is true when it comes to slips, trips and falls. It could be a slip on a wet floor, a trip over a poorly maintained pavement or a fall that would not have happened had the correct actions and safeguards been in place. This was highlighted in a recent case of a construction firm that was heavily fined after an employee fell into a concrete chute. The employee suffered head injuries and a broken arm, but on investigation, the Health and Safety Executive found that the company had no policy on working at height, a basic responsibility for all companies. As in the case above, a slip, trip or fall happens in the blink of an eye and the results devastating. From broken bones to damaged ligaments, there are many injuries that can result. What can make the injury worse is that the accident was avoidable, and the result of someone else’s negligence. This guide has everything you need to know, including slip, trip or falls compensation amounts to how to go about making a claim. We understand that making a claim is daunting but with our professional advice and support, you can win the compensation you deserve. A slip, trip or fall injury can be severe and they are more common than you think too. Statistics from the Health and Safety Executive (HSE) tell us that the largest category leading to injuries every year are slip, trips and falls in the workplace. Thankfully, most slip, trips and falls result in non-fatal injuries, a piece of good news but the statistics make for sobering reading. Under RIDDOR reporting, 29% of reported workplace accidents were slips, trips and falls on the same level. Musculoskeletal injuries are common after a slip or trip, along with cuts and bruises. In some cases, fractures can result, and dislocations are not unheard of either. Tripping occurs when someone catches their foot unexpectedly. It can be because the surface is uneven or there is a change in the level of the floor that they don’t know is there. Falling from a height is a workplace accident that the HSE say is still very much an issue. No one likes to think that they could be involved in an accident at work or in a place that is public that could lead to them being injured as a result of a slip, trip or fall. But it can – and does – happen. It may not be your first thought, but you can gather vital information at the scene of your accident, all of which can be used if you decide to claim for compensation. Take photos – most of us own a smartphone with a good integral camera so take plenty of photos. This includes the site of the accident, what caused you to trip or to slip, for example. Take photos of the surrounding area too, to show that there were no warning signs for example. Witnesses – as is usually the case, when someone is hurt, many people will come to help. If there are any witnesses to your accident, ask them for their contact details so that in the case you opt to claim compensation, your legal team can use their statements to support your case. Medical help – as we have seen, some people suffer injuries that can range from cuts and bruises to broken bones and dislocations. It is important that if you have been hurt that you seek medical advice and treatment for your injuries. The extent and severity of your injuries will inform slip and trip compensation amounts Some people take photos of their injuries too useful as evidence as part of your claim. Depending on your case, you may have your injuries examined further too, to ensure that you receive the right level of compensation. Our slip, trip and fall compensation calculator is a useful tool to use when considering making a claim. To make a claim for compensation after an accident that was by no means your fault, you will no doubt need the help of a solicitor. Essentially, you want a solicitor who specialises in personal injury claims and one that has experience of making claims for injuries and slip, trip or fall accidents like yours. Cost – for many people, the initial worry about making a compensation claim is cost. How will they pay a legal bill? Will it be worth it once you have paid costs from the compensation you receive? But with a no win, no fee personal injury solicitor, you can be confident that should you lose your case, you pay nothing. But always check the small print as not all solicitors off the same terms and conditions as part of their Conditional Fee Agreements, what we know as, as no win, no fee. Do you have a case? – at Accident Claims, our ethos is simple and straightforward: at the heart of our service is YOU. Our customer care is of an exceptional standard and we want to ensure that before you start your claim for the injuries you received as a result of a fall, trip or slip is one that it has all the hallmarks of a successful case. We do this through a free consultancy session. We examine your case, performing a quick fact-find about the circumstances that led to the accident, and the resulting injuries. In a nutshell, when you come to us we place YOU at the centre of your claim. We do everything we can to ensure minimal disruption to you as recuperate from your accident. For example, we make sure that any medical appointments are arranged close to you where you live to minimise travel. Who is Liable for Your Slip, Trip or Fall? In order to claim for your injuries, there needs to be a clear case liability. This means that someone – an individual, company, council, a business for example – were negligent in their duty of care. Slips, trips and falls can happen when someone, including a council or business, has responsibility for ensuring that their premises and public spaces are safe for people to use. A council, for example, has responsibility for the upkeep of pavements and a business must ensure that its premises don’t present a hazard. But there are times when, for whatever reasons, there is a failure in this duty of care and as a result, you were hurt. It may be that the business did not mop up a spillage on the shop floor, causing you to sleep or didn’t act when they knew the floor was slippery. Or the local council did not repair the pavement in a timely or point out the hazard to users, resulting in people making council compensation claims for their injuries. The HSE note that of all non-fatal accidents at work, the biggest category resulting in injury are slips, trips and falls. As an employer, there is a duty of care placed on them to ensure that all employees, visitors, contractors and customers are safe on their premises. 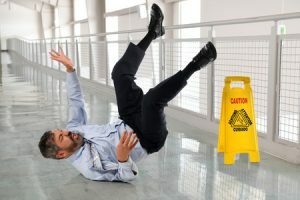 Where trips and falls are a known hazard, a business is expected to have slips, trips and falls risk assessment. This is the process that identifies risks, note hazards and, more importantly, sets out what action is to be taken to reduce the risk. Many employers complete this process, such as slips, trips and falls risk assessment at NHS hospitals and clinics, as the risk of slipping in some areas is high. But accidents do still happen and with only the smallest of changes, they could be prevented. A national frozen food retailer was fined in 2017 for a missing handrail that led to an employee falling, causing them injuries that although not life-threatening or life-changing, were still severe. Slips and trips, along with falls, can also happen in a public place. In order to make a claim, we would need to find out who is responsible for the maintenance and upkeep of the area. Most public places are the responsibility of the local council and thus, a personal injury claim would be levied against them. Damp floors, spilt drinks or drop food can present a significant slip hazard in a restaurant or café. As with other businesses, the management and staff should be trained in health and safety, continually identifying risks throughout service and taking action where a risk or hazard presents itself. As soon as a problem with a potential slippery fall or trip hazard is noted, there should be signs to warn people of the danger, but the spill or problem dealt with as soon as possible. Again, spilt drinks present a significant hazard in a pub or nightclub, with the staff and management expected to continually monitor and act. If they are deemed to be negligent and you were hurt as a result of the slip, trip or fall, you might be able to claim compensation. A delivery driver who slipped on an unsecured mat at a pub of a national chain received £165,000 in compensation. The court heard that the mat was located at the door and as the driver who was carrying an item that was being removed from the premises walked on it, it slipped from underneath him, causing him to fall heavily. Landing on his ankle awkwardly meant a severe break that required surgery. His solicitors also told the court how he was expected to recover but there were still prolonged periods of pain and discomfort, something that was expected to continue. A medical assessment also highlighted that due to the severity of the break, it was likely to be a ‘nuisance injury’; in other words, he would continue to suffer from occasional aching and pain in the joint for many years to come. The court decided that the hazard of the mat should have been spotted, meaning it should have either been removed or fixed securely on the floor. It was, they concluded, an accident waiting to happen. As you shop in your local supermarket or take a shopping trip to the high street, you expect that wherever you go, the businesses and retailers will take all necessary steps to ensure your safety. What you don’t expect is obstacles to trip over, a slippery floor that causes you to fall or a to take a tumble as a result of uneven flooring. When a breach of care of duty can be proven, you may have a claim for compensation. This was the case at the start of 2018 when a well-known national retailer operating convenience stores throughout the country were fined £60,000 for a ramp that was considered unsafe. Customers were tripping over the uneven surface, leading to some small injuries. If you live in rented accommodation, including social housing, your landlord has a duty of care to maintain the premises and grounds to a standard that makes it safe to live in and use. The housing association, landlord or council – whoever is your landlord – should fix or remove dangers as soon as is reasonably possible. If this is not the case, and you were hurt you could make a claim against your landlord. General damages – are defined as ‘non-economic’ damages. for the pain, suffering and emotional distress caused by being hurt. Care claim – this can be included if you have needed or will continue to need personal help in your home, to care for yourself and so on. Loss of earnings – if you have been unable to work or have had to work part-time for a period of time, it may be possible to recoup this cost. Travel Expenses – travel to and from appointments relating to your claim can also be claimed for. Medical Expenses – with the NHS at full stretch, you may have had to pay for some treatment such as private physio sessions and so on. It may be possible to claim these expenses back as part of your compensation claim. Some injuries resulting from a slip, trip or fall can be minor and short-term, such as cuts and bruises. They will heal, and you will go on to live your life as you normally would. Other injuries take longer to heal, such as a broken wrist or hand, or whiplash as a result of a fall at work and so on. There can be serious and fatal injuries too, especially after falling from a height. The HSE statistics still show that of the fatalities in the workplace, most correspond to a fall from a height, which has resulted from a slip or trip. This is a small sample of average compensation for slip and fall injury claims. Your case will depend on the nature of your injuries, with your personal injury solicitor acting as a guide to the amount you could claim. Our slip and fall compensation calculator provides a useful guide too. No win, no fee should mean what it says: if you don’t win your claim, you are not liable to pay a personal injury solicitor. But check the small print as not all solicitors have the same terms and conditions. But, when you come to Accident Claims, you can trust that our expert panels of solicitors do offer their services on no win, no fee bases. If they are not successful, you don’t pay anything in legal costs or fees. This means you can make a claim, safe in the knowledge that there is no financial risk to you, ideal when you may be suffering from a depleted income as a result of not being able to work. We have 40 years of experience in helping people access the legal help they need to make personal injury claims, from council compensation claims to a fall at work claim. Easily accessible, we can be contacted via online chat, email and our freephone number. If you want to start your claim or want more information, there is no better time than NOW to call our team! Whether you are claiming for a shoulder injury after slipping in a supermarket, for an injury to your foot after tripping on an uneven pavement, for a twisted knee after falling over an obstacle at work or making a claim for slipping on a wet floor, call us today to discuss your claim on 0800 073 8801. The document from the HSE looks at the causes of slips, trips and falls in the workplace and how they can be prevented. It also highlights employer and employee responsibility when it comes to health and safety. There are specific schemes, such as ‘Raising the Bar’ that are initiatives to prevent common accidents in the workplace, such as reducing the risks of slipping, tripping and falling within construction. This looks at the latest accident and slips, trips and falls in the workplace statistics for in the workplace in the UK. It presents a clear picture of the work left to do to ensure safety at work. Uneven pavements present significant trip hazards. To prevent pavement trip compensation claims, the Government and local councils are encouraging people to report hazardous pavements which you can at the above website by entering the postcode.